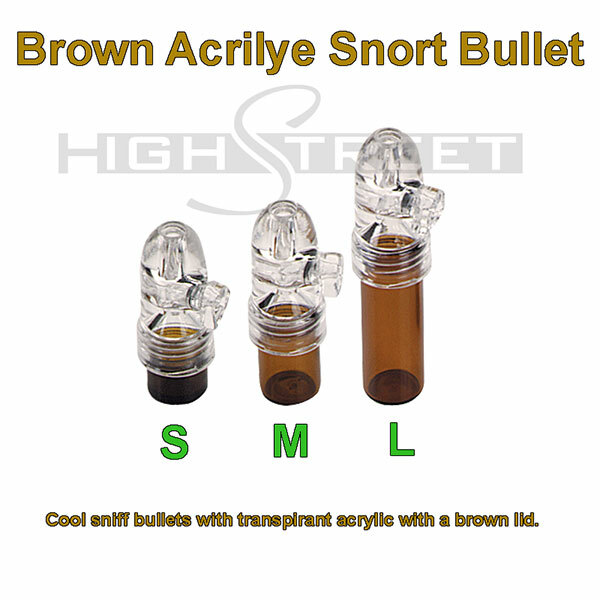 This cool sniff bullet is transpirant acrylic with a brown lid. Featuring a twistable stopper for easy access to your sniff anytime, anywhere. Easier and discreet snorting is not possible. Snorter Bottle for all you can snuff. With plastic top and glass bottom part. Fill the substance into the bottom part (the small brown glass bottle). Then screw the acrylic top onto the vial. There is a revolving valve at the top part, which is locked if you turn it downward. Turn the Snorter upside down and open the valve. The substance slides into the acrylic part. Close the valve again and turn the Snorter Bottle back into the basic position. Now you have the right amount ready to snuff. This quality SNS bullet is one of our best sellers . It allows you to fill it with SNUFF, SNORT, SNOW and deliver a measured amount of it with the least amount of FUSS! Very easy to use and allows people to use SNUFF in public without people noticing. Share your experience about Brown Acrilye Snort Bullet with other customers. Submit your tips or thought on this product, be detailed and specific.